Home folders contain files of an individual account. Using Samba, you can share the directories to enable network users to store own files on their home folder on the file server. Windows does not support this feature, and certain settings, such as folder redirection in an Active Directory (AD), require a workaround instead and you cannot use the official solution. You must create each new user's home directory manually. The [homes] feature is not supported running on a Samba Active Directory (AD) domain controller (DC). In the following, the directory containing the home folders are shared using the users share name. Each user's home directory is created as a subdirectory on the \\server\users\ share, such as, \\server\users\user_name. This is the same format used in a Microsoft Windows environment and requires no additional work to set up. 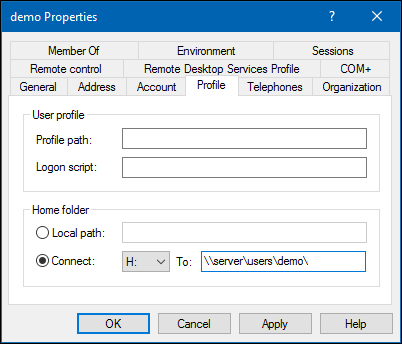 Setting extended access control lists (ACL) on the share that hosts home directories enables you to create new users in the Active Directory Users and Computers application without manually creating the user's home folder and setting permissions. On a Samba share, you can omit the SYSTEM account in the file system ACLs. For details, see The SYSTEM Account. 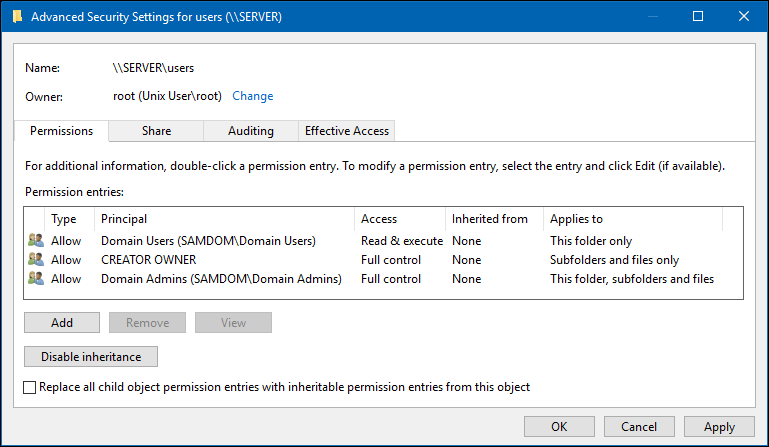 These settings enable members of the Domain Admins group to set the user home folder in the Active Directory Users and Computers application, that automatically creates the home folder and sets the correct permissions. Instead of using Windows access control lists (ACL), you can set up a share using POSIX ACLs on your Samba server. However, when using POSIX ACL to set permissions, you must create the home directory for each new user manually and set permissions. When setting up the share on a Samba Active Directory (AD) domain controller (DC), you cannot use POSIX ACLs. On an Samba DC, only shares using extended ACLs are supported. For further details, see Enable Extended ACL Support in the smb.conf File. To set up the share on a Samba AD DC, see Setting up the Home Folder Share on the Samba File Server - Using Windows ACLs. Do not use homes as name of the share. For further details, see Introduction. In a domain, the Domain Users group is a group, all domain user accounts are member of. Alternatively, or if you are running a non-domain environment, you can set it to any group that exists locally. However, user accounts must be member of this group to access the share. Log in to a Windows machine using an account that has permissions to create new folders on the \\server\users\ share. Navigate to the \\server\users\ share. Create a new home folder for the user. Add the user to the access control list (ACL) of the folder and grant Full control to the user. For details, see Setting ACLs on a Folder. In an Active Directory, you can use the Active Directory Users and Computers Windows application to set the path to the user home folder and the assigned drive letter. If you do not have the Remote Server Administration Tools (RSAT) installed, see Installing RSAT. Log in to a computer using an account that is able to edit user accounts. Select Connect, the drive letter Windows assigns the mapped home folder to, and enter the path to the home folder into the To field. the permissions on the users share were incorrectly set when you set up the share using Windows access control lists (ACL). To fix the problem, set the permissions described in Using Windows ACLs. you set up the share using POSIX ACL. To fix the problem, create the directory manually. See Creating the Home Folder for a New User - Using POSIX ACLs. Using group policy preferences, you can assign settings to organizational units (OU) or to a domain. This enables you, for example, to automatically assign home folder paths to all users in the OU or domain. If you move the account to a different OU or domain, the setting is removed or updated. Using this way, you do not have to assign manually the setting to each user account. Enter a name for the GPO, such as Home folders on server. The new GPO is shown below the domain entry. 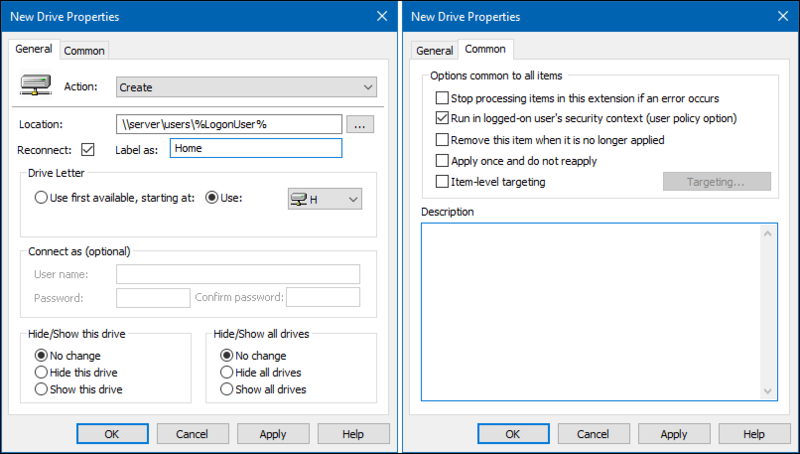 Navigate to the User Configuration → Preferences → Windows Settings → Drive Maps entry. Right-click to the Drive Maps entry and select New → Mapped Drive. Use: Select a drive letter the home folder is mapped to. The policy is applied to users in the OU or domain, the policy is assigned to, during the next log in. Log on to the Windows machine using an account that is member of the local Administrators group. Open the lusrmgr.msc (Local User and Groups) application. The lusrmgr.msc application is not available in Windows Home editions. Click Users in the navigation on the left side. Navigate to the Profile tab. You must set the mapping for each user on every Windows client manually. This page was last modified on 11 March 2017, at 01:37. This page has been accessed 132,670 times.